With one thing and another, the opportunity to ski has never before presented itself. With a three year old, and a seven year old in tow, my wife suggested we take up skiing. So off we went. We've been a few times, and thoroughly enjoyed it. The wee princess doesn't enjoy it; the wee man flips between loving it and hating it, but gets stuck in with an admirable tenacity. While loving it, he caught the tow lift, which runs beside the distracting trick park, so inevitably he fell off the lift, and started hating it again. 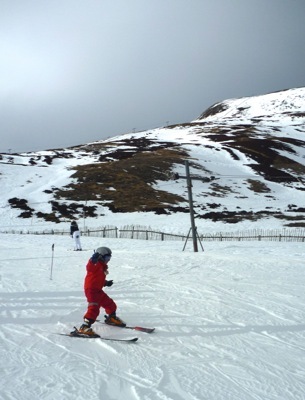 My own ski skills are very much 'L' plated, and to try and get him out of the way and safely up the mountain I used verbal instruction, rather than physically pulling him upright. Over the noise of his frustration, he didn't hear. So I instructed louder. So he screamed his hatred of unfair ski lifts even louder. And so on. And then it started hailing, and I told him (loudly) to look away from the wind so it wouldn't sting. He didn't. I yelled louder. And so on. A passing snowboarder, all blonde dreads and spliff, told me to chill out. I never meant to be angry, I only meant to be heard.